There is much observational evidence which suggests that supermassive black holes (SMBHs) and their host galaxies co-evolve in interesting ways. This connection is not completely understood. For example, massive galaxies with bulges usually have an SMBH, but recent observations have shown that bulgeless disks and dwarf galaxies can have SMBHs as well. Furthermore, it is not yet clear whether a galaxy’s mass affects how likely it is to contain an SMBH. Today’s astrobite explores these issues using numerical simulations. First, let’s review some of the background on SMBH formation. The “seeds” of supermassive black holes are thought to have formed at high redshift (z~15-30), then grown to about 109 M☉ by a redshift of about 6. One idea is that these seeds are formed from the core-collapse of the first stars (or “Population III” stars). Another idea is that dynamical instabilities of metal poor, low-angular momentum gas could allow the gas to collapse directly, forming a black hole of mass 104 to 106M☉— this process of seed formation would require larger halos which would allow for such large inflow. In both of the above proposed mechanisms for SMBH seed formation, the physical processes are still well below the resolution scale of all modern cosmological simulations. Hence, the actual physics of seed formation cannot be directly simulated in a cosmological simulation, and a more ad-hoc method of seed formation must be inserted into the code. Previous simulations have generally included planting seed black holes into any halos that reach a certain mass (usually about 1010 M☉), ignoring metallicity and disallowing multiple seeds from forming in the same halo. The authors of today’s paper use SPH hydrodynamic simulations to probe SMBH formation and galaxy occupation. They propose a more physically-motivated seed formation algorithm than the simple halo-insertion method described above. Specifically, since actual SMBH seed formation seems to depend on the local gas density, temperature, metallicity, etc, it makes sense to use a subgrid simulation algorithm that depends on the local gas properties as well. In most modern cosmological simulations, the local gas properties are used to determine the local star formation rate. For example, star particles are generally only allowed to form in areas where the local gas density exceeds some minimum threshold. The authors extend this idea in their implementation of SMBH seed formation. Specifically, any time the conditions for a star particle to form are satisfied, a black hole seed can form there as well, with a few additional stipulations. The first stipulation is that the gas must have zero metallicity; this ensures that the simulation only accounts for black hole formation at high redshifts. The second extension is that there is an additional probabilistic fudge factor seed which the code uses to determine whether to convert a given particle (which satisfies all of the above) into a black hole. Note that these seeds are not allowed to grow through gas accretion, nor are any black hole feedback effects included. Hence the results represent more of a lower limit on SMBH seed populations, and the results are, the authors argue, more robust since they do not depend on too much subgrid modelling. From Fig 1. of paper (in both plots, seed = 0.1). Left: Formation history. Right: Mass of halo at time of BH formation. The colors denote three different simulation runs with varying resolution, gas/DM ratio, etc. (see Table 1 in paper). The authors find that the SMBH seeds form in an initial burst, as most of the gas is still pristine (zero metallicity). The formation rate tapers off at about z~5 though, as the gas is enriched by supernovae from the deaths of the first generation of stars (see figure 1 above). Seed formation is concentrated in halos with masses between 107 and 109M☉. Furthermore, the time of formation and black hole occupation fraction are functions of the halo mass as well (see figure below). 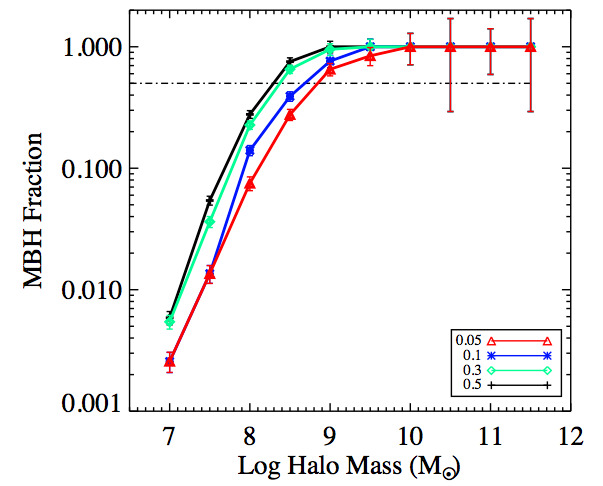 Note that the halos of mass greater than 109M☉ host SMBHs regardless of the efficiency of seed formation, while the occupation fraction for smaller halos increases with black hole formation efficiency. A final interesting result is that the authors note that SMBH seeds could form at lower redshifts, if they were to form away from star-forming regions. Specifically, halos near cosmic voids would have significantly lower metallicity than halos in high-density regions, which could allow them to form SMBH seeds at much lower redshift.